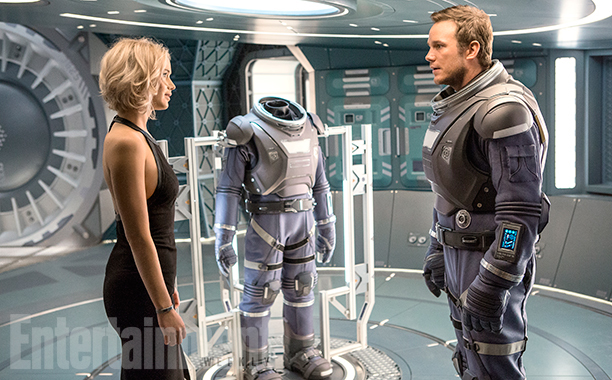 The official trailer for Passengers the latest film from Chris Pratt and Jennifer has finally landed online. Directed by Academy Award nominee Morten Tyldum, who wowed us all with The Imitation Game back in 2014, Passengers stars two previous Marvel alumni, Christ Pratt and Jennifer Lawrence. The pair play Aurora and Jim, two unlucky souls who volunteered for a 120-year voyage to a distant colony planet known as ‘Homestead II’, unfortunately for them things turn sour when they’re let out of their cryo-sleep early. If the trailer’s anything to go by though the pair won’t be twiddling their thumbs while they wait the 90 years it’ll take them to get to their new home and they’ll be plenty of action and even a romance to keep them entertained. Joining Lawrence and Pratt on their long journey to Homestead II are Michael Sheen as a robot bartender and Laurence Fishburne. Passenger’s has been a long time coming, it floated abut for years on Hollywood’s notorious black list since 2007, Keanu Reeves and Reese Wetherspoon were originally attached, but the rights were snapped up by Sony in 2014. Passengers will be rocketing into a theatre near you on 23 December, 2016.